The Star Casino will incorporate facial recognition technology as part of an ongoing $10 million security upgrade, after a croupier was caught stealing a $5000 chip while on duty. CCTV footage obtained by The Daily Telegraph, shows how the staffer snatched one of the chips and slipped it into his sock. As a result, facial recognition cameras that will soon be deployed in high risk areas across the casino floor, and the technology will assist with matching people’s faces against previous offenders held on the casino’s database. In addition, the prominent Vegas-styled casino will also get new door alarms, infra-red night vision cameras, motion sensors, and ID scanners, among other things. Ms Clark further assured that security and surveillance are a 24-hour, seven-day-a-week operation, with 150 people manning the teams on busy weekends. There has been no comment on how the casino intends to deal with the stealing croupier. Star casino is the second largest casino after Crown Casino in Melbourne, and is owned by The Star Entertainment Group. It has partnered with Hong Kong-based multi-faceted investors Chow Tai Fook and Far East Consortium, to invest more than A$500 million into the expansion of the existing complex and the addition of a new hotel and residences tower that will include new resort amenities, enhanced food and beverage options, and a neighborhood center, among other facilities. Online pokies are dominating the internet and everyone is becoming more aware of their presence unlike a few years ago when players took to gambling at the tables. Online pokies draw players’ attention like a seductress leading the way into a harem. In this instance, the harem is a variety of themes, paylines, bet sizes and everyone is spoiled for choice. So why are pokies making a revolutionary statement and how can we foresee them dominating the gaming realm? Here is why we are happy to follow whatever leads us to the realm of endless possibilities. Leading software developer brands such as NetEnt, Microgaming and Playtech, are continuously striving for better quality pokies games. They are laser focused on the pleasurable experience players encounter when playing their branded pokies. They are, of course, also focused on beating competitive brands and becoming the ultimate software companies. This definitely works in favour of the player as well as for the online casino who can host a long list of various pokies games to choose from. As such, online casino players are spoiled for choice and as a result, land based gambling is slowing being phased out. But how does this factor into dominating the gaming realm? Firstly, players are privy to more options than just table games. Pokies are being released based on movie hits trending in the cinema or based on popular TV shows. Some consist of a series of hidden games, something that intrigues any player and also something you cannot find with any other variety of casino games. Also, more than most casino games, pokies allow free games to be won while still increasing players bankrolls. Online casinos lure new members in by offering them sign up and welcome bonuses. Generally, these kinds of deals come with wagering requirements. This means players will need to make a series of wagers of a certain percentage in order to claim any winnings earned using these sign up bonuses. Online casinos prefer to use pokies as a preferred game to sign up as they offer free spins up to a given amount. Unlike table games, pokies don’t require practice or a set of skills, so beginner players are really just having fun while experiencing the quality of the casino. If an online casino had to offer an hour free play at the craps table as a sign up bonus, newbie players would immediately feel intimidated or less inclined to join the casino as they would ultimately need real cash to deposit in order to claim any winnings and in all honesty, who wants to place a bet with real money on a game they are unfamiliar with? New players aren’t necessarily unseasoned players; they may be new to playing pokies, but what better way to get acquainted with one of the easiest games online casinos have to offer than snatching an exclusive casino deal? Taking a look at how pokies has evolved throughout the years, should be evidence enough that in the years to come they will dominate the majority of online casinos. The birth of the pokie machine began within land based casino establishments. As technology progressed, online casinos came into fruition, and next came a small selection of casino games which included pokies. Ever since the inception of online casinos, pokies has claimed the limelight with better graphics, sound quality and interactive gaming. When players get bored of one pokie game, they can easily move onto the next. 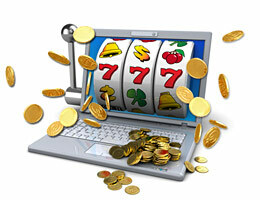 As with the progression of online pokies, players also progress. They begin to discover which games they prefer, the amount of paylines they favour, and of course how much they can afford to spend. This takes us to the next revelation as stated below. Unlike other casino games, pokies are relatively affordable and don’t require large bet sums. There is no pot to be won, unless you looking at progressive slots, and they can be played with as little as 0.01 coins. Even though the smaller the bet amount, the smaller the payout, but for those lucky enough to generate a bigger bankroll through a minimal bet, it makes the world of difference. Players will then be able to progress onto bigger pokies games and potentially make even bigger payouts, something which is almost impossible to do with other casino games at the small price of a 0.01 coin. To find the best pokies online doesn’t take much effort nor does it require expertise in research. Casino across the World Wide Web proudly present and deliver an outrageous number of fascinating pokies games, some of which are available through free play. This is another reason players are inclined to play pokies without hesitation. Players can resort to their most favoured casinos and no doubt, they will stumble upon the latest releases, proudly displayed on the casino site. This is another fantastic reason why we see pokies taking the lead in online gaming. Many may beg to disagree that pokies isn’t the future of online gambling, some may even argue that table games are the foundation of online casinos. And while every player may have different beliefs, one thing remains a constant, online pokie games are in abundance and the majority at online casinos. They are continuously evolving and offering players something newer, shinier and better than the last one. Gaming software brands are focusing on bringing in the best games to a more realistic dimension and online players are looking into virtual games and technology that is moving the gaming realm into the future. Pokies have a powerful effect on the gaming community as a whole and taking into consideration there are casinos solely dedicated to the phenomenal variety of the game, it really isn’t hard to believe that they will eventually dominate every online casino. Are pokies the future of tomorrow’s players? The players who are the future of tomorrow are probably in their twenties now. It is interesting to note that almost 50% of these people gamble. However, the question remains that is all the gambling taking place on poker machines. Where do these players play, in clubs and pubs or online pokies? What do they look for in gambling? On behalf of ClubsNSW and IGT, Utting Research carried out a survey where the aim is to understand the attitude of the players towards gambling. 20-29 year olds were targeted for the research. There were a total of 800 people and the research was done via online questionnaire. The test was done in September 2017 after initial research done through focus groups. The main target audience was respondents, who said that they gambled minimum every 6 months. Nigel Turner at IGT said that usually twenty something is the group which is believed to shun all kinds of traditional gambling venues and pokies. Instead of these conventional means, they would prefer using digital media like mobile phones, smartphones or other kinds of digital resources instead of a fixed machine. The motive of the research was to find out the real scenario. 50% of young people in their twenties gamble on various things, including horse/dog racing, sports betting, casino games, pokies, online non-sports etc. Scratchies and lotteries are not included here. The gender split was kind of 58% men and 42% women. Sports betting came out to be more popular than pokies. 42% are seen gambling minimum once every three months, 13% weekly and 16% monthly. Pokies rank second with 33% playing once every 3 months, 12% monthly and 5% weekly. Occasional playing is attributed to 61%. 52% of youngsters who were surveyed earn more than $80K per annum with majority spending less than $50 a week on gambling. Most of the gamblers are modest and don’t want to take any kinds of risks. The research also showed that 60% of the surveyed group visit a pub every month and30% visit a club. 22% gamble in a club while 26% gamble in pubs. When specific questions were asked on pokies, the numbers just reversed – 22% in pubs and 26% in clubs. In the research it was established that pubs were better destinations for watching sports, enjoying food and drinks. However, when it came to playing pokies, clubs surely won over pubs greatly. Many gamblers opine that they do not fancy playing at pokies in clubs, as the joints seem unfriendly and too dark. The majority who still play usually look for a game which is based on cost of play per spin. However, pokie players who are frequent and experienced will look for themed or classic games or search for jackpots. When it comes to poker machines, what do the 20-somethings want from the device? The one thing they want is that all friends should be able to play together; there should be games of different skill levels and involvement; having an intense engagement, etc. However, there are many who want the place to be a place for socializing where they can eat, drink and enjoy some games. More than 50% of players wanted some element of skill which should be used in the machine play. Young gamblers are not very averse to pokies though there is a lot of negative publicity in the media regarding the same. The market is quite large. Half of the people in their 20s are into gambling on pokies and almost 1/3rd playing pokies minimum once in 3 months. New types of games can be tried in the pokies – skill based casual games need mention here along with electronic betting games. CrownBet, Australian sports betting operator has been rebranded as BetEasy. This has happened after the recent acquisition of William Hill Australia’s assets. The news was flashed by Matt Trip, the company’s CEO in an interview with Fairfax Media, the local news outlet. The relaunching of the rebranded business will take place in mid-August. Early in this year, William Hill made an announcement that the company was in the process of reviewing the Australian businesses, which are underperforming. The company also thought of business sale among the possibilities under consideration. The bidding process for the business was fierce and finally CrownBet was announced as the buyer of the betting operation in the month of February. Almost at the same time The Stars Group, which is the Canadian gambling giant announced that they would acquire almost 80% equity in CrownBet from Crown Resorts, which is an Australian casino operator. Reports came into circulation this spring season after the acquisition deals that CrownBet was planning to rebrand as part of its merging with William Hill Australia. It also became popularly known that Mr. Tripp and his team had chosen the name as Sportingbet. This was a popular local betting operator once operated by his father Alan. The three brands acquired by William Hill on its entry in the Australian gambling market was Sportingbet along with Centrebet and Tom Waterhouse. The three businesses were later amalgamated by the British bookmaker into William Hill Australia. The original rebrand plan of BrownBet fell after SportsBet owners moved the court. They vouched that SportingBet sounded similar to SportsBet and this would create confusion in the mind of the customers. While some might think, both are same, some might think that they are related and so on. The court published an order where the planned rebrand has been temporarily blocked. On Tuesday Mr. Tripp announced that their combined business will have a new name and it would be BetEasy. This name would sound familiar with the customers – both with William Hill Australia people and CrownBet lot. Mr. Tripp was personally slightly upset because he loved the name SportingBet, but he had no personal grudge at the legal action took by SportsBet. The amalgamation of William Hill Australia and CrownBet will be the country’s third largest sports betting operator along with SportsBet and Tabcorp. This new branding is taking place at a time when there is heavy competition, new taxes and tight advertising restrictions on licensed Australian operators. Mr. Tripp said to Fairfax Media that they supported measures which are taken for protecting gambling customers well, but they also cannot sugarcoat the reality that operators are facing greater challenges than before. Operators are being charged between 8%-15% on local revenues for consumption taxes in many Australian states and territories. Local lawmakers show the same reasons for implementation of new tax regimes. They have a point which says that the government can benefit from the growing sports betting industry exceptionally well. Gambling reformers in Victoria, Australia are looking to make pokies or video slot terminals a raging issue in the coming elections in the city. An anti-gambling group in Victoria, the prominent Australian state, is coming up with a political effort for having a maximum wager allowance on states pokies to be reduced to AUS $1 (USD $0.74 and £ 0.56), which is 1/5th of the current cap AUS $5 (USD $3.7 and £ 2.8) per wager. The launch of this campaign comes just 4 months before the general election in Victoria in fall season. The anti-gambling group is known as the Alliance for Gambling Reform (AGR) and its main motive is to address the topic of addictive gambling behavior and bring it to the forefront during the coming election campaigns. Victoria is situated on the eastern side of Australia and is a major metropolitan center of Melbourne. The anti-pokies push by the AGR is very similar and considered almost parallel to the FOBT (fixed odds betting terminals) clash in UK. The clash in UK resulted in a massive reduction of the wagering caps for the various terminals all over the UK just a few months back. The term ‘pokies’ is considered as a contradiction and is unique to Australia. The reference is actually made for video gaming terminals or slots, almost same kinds of devices which are the center of a furor in the UK. Along with the reduction in wager maximum, there are also other restrictions which the AGR wants to be implemented on the machines. They want reduced hours of operation for the terminals at various clubs and hotels. However, there will be no restrictions of any kind on the casinos. The group is also vouching for a daily cap of $200 per gambler in EFTs (electronic fund transfer). They also want removal of various programmed slot machine features, which are believed to be contributing to problem gambling. These include free spins, linked jackpots and losses which are disguised as wins. It is interesting to see that many mayors from the different leading municipalities in Victoria are supporting the aims with which the group AGR is progressing. The anti-pokies group has been able to assemble such people as a part of the election-cycle push. The group announced their “Councils Unite for Pokies Reform” movement and asked all parties to come together and work towards gambling reform in Victoria. The AGR spokesperson Tim Costello was joined by many eminent mayors at the State Parliament press opportunity. Some of the eminent personalities included Whittlesea mayor Kris Pavlidis, Moreland mayor John Kavanagh, Yarra Acting Mayor Misha Coleman, Darebin mayor Kim le Cerf, Greater Dandenong councilor Matthew Kirwan and Hume councilor Joseph Haweil. 18 Victorian councils supported the reform program. However, Melbourne is not included in the list as it is the home of the famous Crown Casino, which fought against the efforts of AGR previously. AGR’s spokesperson Costello had previously assailed the gaming industry in Australia and Crown Casino. In a recently published manifesto, Alliance for Gambling Reform asserted that family violence is seeing a steep rise and pokies are responsible for the same. The group claims that as per reports and research, it has been seen that people who have problems in gambling are perpetrators of family violence. The numbers are much less for people who do not have gambling issues. People with gambling problems have shown evidences of physical violence on their spouses and children. Research reports have shown that there are three times more chances of family violence taking place where gambling is involved. This is a significant harm that gambling does to families where people cannot take the game in its full spirit. Oppositions claim that there is no cited research in such matters and the claims are subject to further analysis. However, AGR claims that urgent reforms in gambling should be implemented for preventing family violence, needless suicides, frauds and bankruptcy cases. Addictive poker machines in various pubs and clubs should be controlled and random use should be prohibited to save the damages. Malta based Yggdrasil gaming has come up with its own fan site named yggdrasilcasino.com. In this site, players may engage in playing any title from the company’s catalogue of games without being charged. The operator partners will get traffic-driving promotions. The reputed bingo, casino and table games provider has made a nice proposition for its partners as well as the loyal players, said the company in a recent press release. This pilot project is aimed at extending the company’s reach by promoting the partners. As per this promotion, the entire range of Yggdrasil Casino promotional activities is going to be offered at zero cost till the end of 2018 to the partners. Fredrik Elmqvist, the CEO said Yggdrasil wants to work with its important partners to promote content of both parties. This move will help the casinos get more players traffic and boost their revenues for sure. Playing at online casinos comes with a great amount of fun as there are abundant choices on offer. There are innumerable software developers, who are developing ultimate games for excellent online gambling entertainment. NetEnt is a well-known name in the online gaming industry. It has launched a brand new campaign so that gamblers can continue winning even during the FIFA World Cup 2018. The Mega Million Campaign by NetEnt is to begin from the 14th of June 2018 and will continue till 15th July 2018. This is a clear indication of the fact that this campaign will provide opportunities for players to enjoy a share in €1,000,000, that too in cash prize all throughout the event of the World Cup. Two highly rewarding progressive jackpot slots will be used for the campaign. The jackpot slots are mega Fortunes and Hall of Gods. Massive cash prizes can be won during the gameplay. There are two sections of the campaign. In the first section, the players have the opportunity of earning up to €3,800 per day on each day of world cup game. In this section solely, there is a total of about €95,000 available in cash for prizes. In the second section of the campaign, there is scope of adding additional € 650,000 to Mega Fortune slot games and € 350,000 to Hall of Gods. The additional cash is added to the mega jackpot pool prize of each individual game. This is the best time when you can begin playing Mega Fortune or Hall of Gods. If you are successful in striking the mega jackpot in any of the games during the World Cup, your life can be changed. Henrik Fagerlund, the Chief Product Officer of NetEnt opines that the main aim of creating the Mega Million Campaign was to enhance the gaming experience of the players. The hype of World Cup football games helps the software provider in pushing their jackpot games to higher and better levels. This special campaign was announced few days after NetEnt was selected as the main stage sponsor of the Central and Eastern European Gaming Conference, which is to take place in September 2018. It is time to start playing if you want to win daily jackpot bonus. For that you have to first find a NetEnt casino and play for bigger wins. You can choose to play at one of the many top NetEnt casinos across the world. Each of the casinos are reviewed and highly rated and aim to provide the best entertainment. Date and Place – Intertops Poker players now stand a chance to walk away with great wins during the $150,000 Orient Express Bonus Competition. The players will compete with one another for weekly prizes of up to $500 each week. They stand a chance to win a total of $30,000 until July 2nd. When players play their favorite online slots and table games on the laptops, desktops, or on mobile casinos installed on their handheld devices, they get to earn frequent player points. As their ponts increase, they move up a virtual score board. “It is exhilarating to see your name move towards the top of the scoreboard!”, quoted one of the players who finds her name among the prize winners every week. “It gets exciting when you jump ahead of another player who may have won a bigger bonus than yourself the previous week! It is great when just a few spins can make a huge difference in the bonus amount that you can walk away with,” she added. The more the players play, the more points they can win and the larger will their weekly prize be. However, occasionally players also get to win prizes from weekly random draws. Top 20 players every week enter a finale $1000 prize draw. And, the cash prize has no wagering requirements attached to it. Last week the famous casino, introduced San Guo Zheng BA – Three Kingdom Wars- a one of its kind online slots that transports players to ancient China and offers them legendary chances to win. The wild symbol of this slot is a powerful dragon. When this dragon appears during free spins that is triggered by 3 scatters, it ups the winning too. Once the free spins are complete, the three God spins begin. During this, players can win wilds, more free games, and multipliers too. This new slot joins several other real money online casino games from the house of Realtime Gaming such as Shanghai Lights and Cai Hong. Tian Di Yuan Su – The new Gods of Nature is also set to debut in June. The latest slot of Quickspin, unveiled on May 8th charmed the gamers in Canada soon enough. Pirate’s Charm has become extremely popular in Canada. The swashbuckling game like many other games of the company has met with rave reviews and great responses from players in the country. In this game from stable of Quickspin, you as the player join a pirate ship to look for the fabled Pirate’s Charms. You have to navigate your way in the open seas- in three rows and 5 reels of the slot. There are some high paying symbols, but players should seek the scatter symbols. The pirate ship serves as the scatter bonus symbol. By landing three in one spin, you get hands on the ten free spins. For each reel covered in the free spins you earn two free spins. When the mystery charms land in free spins Mystery Charms Respins Feature is triggered. This locks the symbols in their places for the respin. Daniel Lindberg, the CEO of Quickspin says this is the company’s darkest creation. The game will be liked by all for its amazing graphics, he says. Online casinos like Casumo and Betsson have placed the slot on their virtual shelves post its release. It will help Quickspin catapult itself to the top league soon- predict the industry experts. At the end of April, Quickspin declared its slot tournament feature. The tournaments will bring prizes and event-oriented rewards. It is made in alliance with Competition Labs. In the tournaments, the players may earn points by using certain symbols. They can also follow the real-time standings as well as progression as per the in-game Leaderboards. The operators can use customization options to use their promotion plans. Aquis Entertainment has been asked to redevelop Casino Canberra in a month or face risk of losing modification rights. The local media outlets such as the Canberra Times have reported that the government has asked the company to wrap the investment proposal by May 14th. The entertainment company based in Hong Kong made a $330 million bid 3 years back to redevelop Casino Canberra. The earlier plan was setting up 500 poker machines. Aquis Entertainment also wanted to set up several luxury shops, cafes and bars. Owing to changed government laws led to restrictions on pokies machines and since then things have started slowing down. Aquis was allowed to set up only 200 pokies machines instead of 500, after changes were made to government laws. Coupled with this, the fact that the company will have to pay for 300 device licenses and forfeit 100 made things worse. The newest financial reports show $13.8 million loss was reported by the Casino Canberra for 2017. So, interest in investing more in fewer poker machines is reduced. The casino lacks a license to offer the poker machines. Aquis executives think 200 devices will not be good enough to surpass financial losses. A company spokesperson said in a recent interview that the government should be realistic in its approach. Aquis Entertainment bought Casino Canberra back in 2014 and had planned to turn it into a five-star category resort. Local officials were upbeat about chance to boost Australian tourism. The latest developments, however have dampened the upbeat mood to an extent.